In Indonesia, the Council of Islamic Scholars developed guidance for girls on MHM, based on religious teachings and advocacy efforts reaching out to religious leaders and mayors. 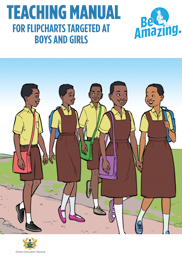 A comic book targeting girls and boys was created to shed light on the issue and a video was made to address teasing of girls. Teaching and learning materials created in Bolivia with municipal governments had reached 10,000 boys and girls in 100 schools by early 2017, with growing interest from other municipalities to replicate the intervention in their own regions, using their own financing. In Burkina Faso, the Ministry of Education has developed a national directive on norms and standards for school latrine design which includes MHM, and an MHM module is included in the Child Friendly Schools Approach national document. Materials produced under WinS4Girls are included materials for school club (‘Deen Kan’) establishment and training. 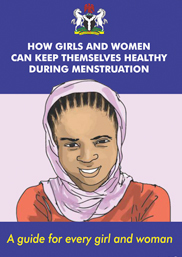 Research by the Ghana Education Service and UNICEF found that half of adolescent girls interviewed lacked basic information about menstruation before starting their first period. The ‘Be Amazing! Period’ campaign, enlisting local celebrities and decision-makers to end taboos and give girls information. 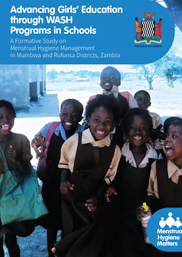 The Ministry of Education in Zambia has integrated WASH and MHM into its education sector policies and plans, including provisions to keep girls in school. Teaching and learning resources have been approved, and the national latrine design for rural schools now provides for a private space within the girls’ latrines for MHM. 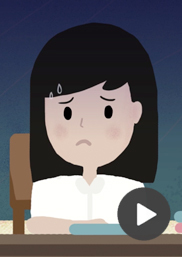 UNICEF envisions a world where every girl can learn, play, and safeguard her own health without experiencing stress, shame, or unnecessary barriers to information or supplies during menstruation. Meeting the hygiene needs of all adolescent girls in all settings – at home and away, and during emergencies – is a fundamental issue of human rights, dignity, and public health. From 2014 - 2017, the Canadian Government funded the project WASH in Schools for Girls: Advocacy and Capacity Building for Menstrual Hygiene Management (MHM) through Water, Sanitation and Hygiene in Schools (WASH) Programs in 14 countries. 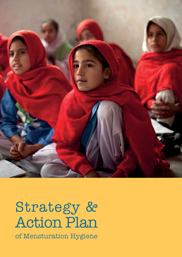 The main aim was to strengthen evidenced-based advocacy and action on MHM in low- and middle-income countries through the UNICEF-supported WASH in Schools global program, leading to a more supportive school environment that is ready for girls. 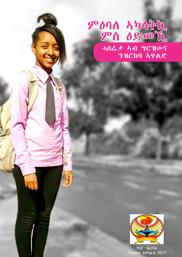 By reducing social and physical barriers to safe and stigma-free MHM in schools and in education sectors and advocacy for effective MHM, the project ultimately aimed to contribute towards a more supportive school environment resulting in increased attendance rates of girls at primary and secondary level. Increased understanding of current MHM practices and barriers girls face in schools in 14 countries. Increased incorporation of gender sensitive MHM support into existing national WinS programme in 14 countries. Increased leadership of Ministries of Education in MHM in 14 countries. Increased capacity of global WinS Network Members on MHM research and programming. 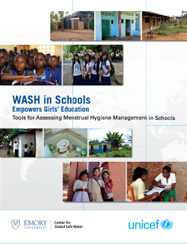 WASH in Schools for Girls e-learning course in formative research developed and rolled out with Emory University and UNGEI to strengthen the capacity of national research partners, WASH practitioners and policy makers, with82 graduates. Formative research on the challenges and barriers faced by girls at schools during menstruation completed in 14 countries. Annual sharing through the Virtual Conference on Menstrual Hygiene Management in Schools, now reaching over 1,000 participants and continues to grow. 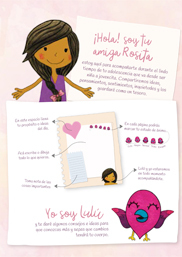 Personalized friendly journal, affective key info/calendar. To translate the guidelines for implementation of MHM at school level through strengthening the capacity and skills. To standardize training of teachers and health workers. Articulate the package of support needed at school level for girls informed by the National MHM guidelines. To create safe, girl-friendly learning environments.